As the demand for water increases, the development of groundwater resources and new types of conjunctive use related to artificial recharge and effluent discharges swiftly moves to the forefront of concern. 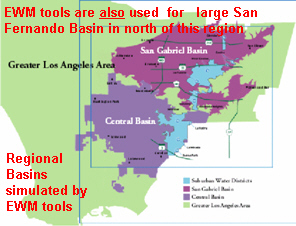 A groundwater basin’s natural boundaries can extend anywhere from hundreds to thousands of square miles out. Quantitative assessments that gauge the availability and sustainability of these groundwater resources need data compilation, conceptual model development, mathematical simulations, and detailed evaluations. Using its customizable technologies, EWM Group provides these support services. EWM tools and procedures have been used to for small to mega-sized basins. of boundaries, rock outcrops, and other natural formations. EWM interface tools generate informative 2-D and 3-D displays. balance estimations, and much more. Calibrated multi-layered groundwater reservoir models of physical properties and historical pumping/recharge rates are needed in order to safely manage water resources. EWM Group’s Groundwater Modelling includes an easy means to add/remove wells, accurately define well screens, local area plumes, and faults by points only (no grids needed). Counties and regulatory agencies willhave an easy means to evaluate the impact of new changes. Several ASR Projects are being implemented to store millions of gallons of surplus wet-year water in the groundwater reservoirs for uses during extended draughts. The closure of old mines and the management of active mines need accurate models of mine structures. These complex geometries cannot be efficiently modeled by available rectangular codes. FE codes require too much labor. EWM Group’s Modelling provides an easy means to model natural rocks, blasted areas, and tunnels. Integrated procedures generate node layers for the transition zones from low to high permeable zones. For rapid infiltration and down gradient extraction, EWM Group’s current technologies are being used for designing pump locations and extraction rates. Particle tracking and contiminant transport assessments are performed to ensure complete extraction of contaminants. Several counties across USA need these types of alternate means for disposal and to maximize the uses of reclaimed water. Groundwater code accurately models each dike and pump without the costly generation of grids. Conjunctive studies of surface and subsurface water are routinely needed for each county. EWM’s current technologies have been used forimpact evaluations of surface disposal of effluents on lakes. However, FE grid generations require substantial time. boundaries for accurate models of disposal facilities. RCRA and Superfund site RI/FS are key markets for groundwater codes. EWM technologies have provided a means for detailed assessment of physical systems and plumes. In addition to being meshless, EWM Groundwater Modelling has built-in utilities for integrated assessment of 1-D unsaturated zones and 3-D saturated flow and transport.